It was another one of Jurgen Klopp's quirky and emphatic ways of putting something that makes you understand exactly how he feels. He had called his Liverpool team "f**king mentality monsters," after finding the means to overcome Southampton on Friday night and who could argue convincingly with him considering it was the fifth game in a row where Liverpool had pushed aside setback by prevailing in the end? If you believe in there being seasons within seasons then Klopp's impression could be a truth. Just as Liverpool's seven-point lead over Manchester City withering away once does not necessarily mean it will happen again if they establish any sort of advantage over their title rivals in the coming weeks, it was only 14 months ago when Porto represented the next away stop in the Champions League following a 3-3 draw in Seville where Liverpool had at one stage infamously led by three goals. What followed in Porto was a 5-0 victory that ensured an easy passage through to the quarter finals. Though the story of that campaign would conclude in Kiev, had it finished in the group stages Klopp could not really have complained. The difference last season was the signing of Virgil van Dijk. This season, Alisson Becker's arrival has pushed the team on to the next stage of development. To understand his impact, see the fate of AS Roma - the club he was signed from and the club Porto defeated in the round of 16. Whereas Roma kept 17 clean sheets last season, this year they only have one. It is the same defence only without Alisson. While Klopp acknowledges his signings have helped Liverpool along, he believes collective understanding has been enhanced by moving on from points or short periods of adversity. That is why he believes he can now qualify Liverpool as "f**king mentality monsters". "What can I expect before a game? I can expect this and that but the longer a season is, and having all the results we have had, you don't get these results with one brilliant performance after another; when it is always easy with 2-0 after 30 minutes, 3-0 after 35 and 4-0 early in the second half," Klopp said at Anfield yesterday. "You have to be really in the game. You grow as a group and you develop a mentality and that is what the boys did." Klopp spoke about the manner of the late victory over Tottenham like it was symbolic. He thought Liverpool did not get enough credit for their first half performance: "nobody spoke about that". The focus instead was all on the levels of the opponent and how Liverpool had been fortunate. He was frustrated with what Liverpool offered from half time up until the point where Tottenham's equaliser came. It was Liverpool's reaction which gave him the most encouragement: to have potentially had the game sewn up, to have played so unconvincingly but then to have found something in reserve. The narrative of Southampton was different because Liverpool fell behind and this showed the team's range in recovering even though the emotions were similar. "For these decisive moments, it is not that you are born a mentality monster but you can become one," Klopp stressed. "The boys are now like this in this moment. So far nobody got rid of us because we are there constantly. Nobody wants us but we are still there. That is exactly what we wanted." Klopp was adamant he'd rather not have drawn Porto who will be motivated to put right what they got terribly wrong last season. He claimed that people who "know football" would feel exactly the same way - though he used that point to remind that no other club would fancy facing Liverpool either, who sealed Champions League qualification for next season at Southampton - a fact that was not missed by Klopp either. 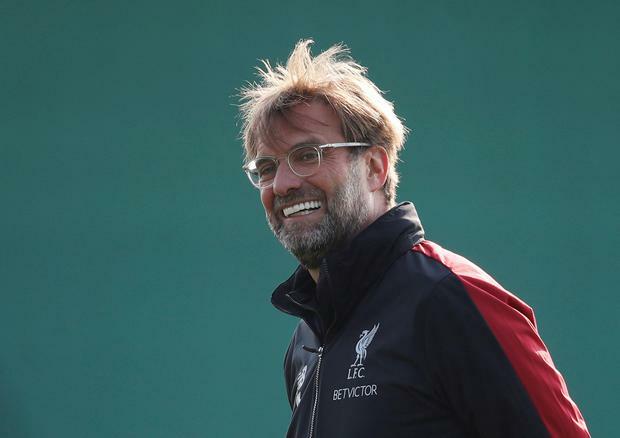 "When I was a young manager I was always dreaming of having a team of world class players with the attitude of a proper challenger," Klopp continued. "That is actually what I love, and we showed that especially in the Champions League very often. We love the competition. This is now one of the toughest places to go." He feels a different pressure this season to last, where the path to the final was made more complicated by Liverpool's toil in the league where they did not seal a top four finish until the final day. "The big difference for me is I want to be as successful as possible but I am a normal employee as well so I know the most important thing is that we need money for next year as well," he explained. "That means we have to qualify for the Champions League. That is real pressure. If you are not for sure in the Champions League it changes everything - you can talk about this and that with the owners but you pretty much don't have to ask them because we don't spend money we don't have. Yes, this is completely different. I love this season much more." "It is all good but now we want to carry on," he emphasised. "It's not that part of the season where you think hopefully it can be over in a few days. We are completely in the middle of the season and the boys want to use their skills and their attitude." Porto, indeed, is an opportunity for Van Dijk and his Liverpool team-mates to reflect the distance travelled but also, a chance to focus on the small steps still left to go - the last of which would potentially represent a giant leap. Such has been the impact of the Dutch defender, it is easy to forget that last season a fixture away in Porto was only his first in the Champions League at a club where only a month before he'd become a record signing. Back then, Van Dijk had no proof that Liverpool would be successful - or emerge as having a chance at being successful, though their ambition was reflected by the sum of money they were willing to pay for him. Considering City wanted to sign him and they were already so far ahead of Liverpool in the league table, it would have been an easier decision to go there. Listening to him, you get the impression that he thinks in any other season Liverpool would have done enough already to have secured the title already. "We have another team in the league that is playing 'pretty' well and it's a bit crazy with the amount of points we both have, that one of us is still not even champions," he said yesterday before he revealed he has voted for Raheem Sterling as player of the year despite the winger being his main rival for the accolade. "At the end of the day, we can keep our heads up high but until the season is over, we just have to give everything that we have got - every inch, every one of us and the fans keep believing."